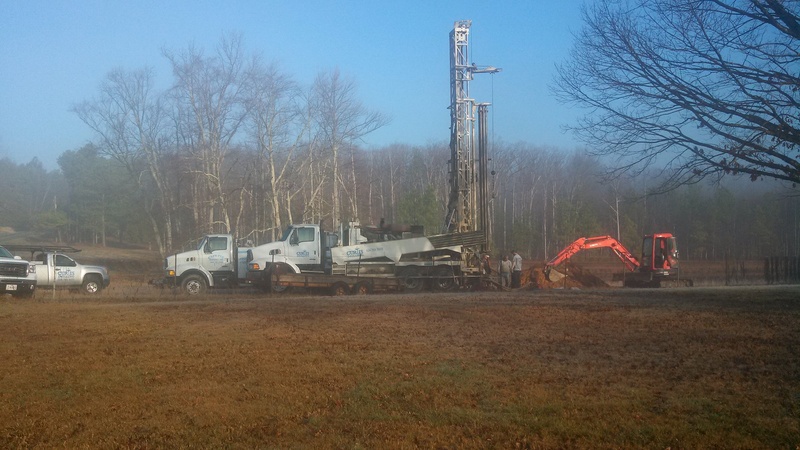 Curtis Drilling provides expertly constructed drilled (deep) wells for the sole purpose of extracting available ground water from within and below confining layers of bedrock. There are two styles of wells common to the region: Drilled (Deep) Wells and Bored (Shallow) Wells. Bored (Shallow) 24”-36” diameter concrete cased wells rely on the available surface water to the immediate area. Water enters by seeping in through the joints of this style of well. This is water that rests on top of the bedrock in unconsolidated loose rocks and dirt. Bored wells are more readily impacted by surface run-off, wet and dry spells, everything man has put back into the environment and inconsistencies when it comes to quality expectations. Our Drilled also known as deep wells are usually 4” -8” in diameter with the most common around 6”. They can be cased in steel but more commonly in white PVC well casing, the white pipe you see that sticks up out of the ground. Drilled/Deep wells reach down below, past where shallow wells get their water from. This is the water that makes up your aquifer. Drilled wells that tap the aquifer source are much less susceptible to environmental and weather events as the source is generally more stable because of its location below a protective confining layer of bed rock. From ordinary geological shifting and settling, these geological inconsistencies can sometimes allow these two water sources to comingle. So it’s fair to say, while shallow/bored wells and deep/drilled wells have their own set of expected characteristics, the two different water sources expected quantity and quality are not mutually exclusive. Water wells are priced by the foot. While we may have a reasonable expectation of water volume for you based on the capacities of surrounding wells, no one knows for sure the depth necessary to get the required volume. While there are required volume minimums for water wells, drilling depth is determined mostly by your needs and your expected demand. The same goes for well casing and required grout. The casing provides for an uninterrupted and secure path through the dirt and loose rocks into the bedrock. 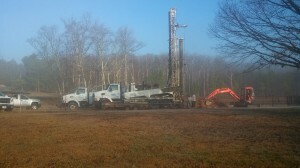 We install the well casing sufficiently into the bedrock to insure a tight fit and proper well integrity. Grout is a compound used to prevent any adjacent surface water from infiltrating your well. It acts as a seal from the groundwater found in your local unconsolidated geology. Check the help page for more information or contact us.